Addis Abeba is the capital of Ethiopia and calls itself the "diplomatic capital" of Africa, by virtue of the fact that the African Union is located here. Yet Ethiopia is still one of the most rural nations in both Africa and the world. Ethiopia also appears to be among the most tolerant. Various forms of Christianity claim account for approximately 65 percent of the population, with the Ethiopian Orthodox Church (Coptic) holding the dominant share. At the same time there is a sizable Muslim minority, at more than 30 percent of the population. Ethiopia has been spared the interfaith violence that has occurred in some other countries where there are large religious minorities. 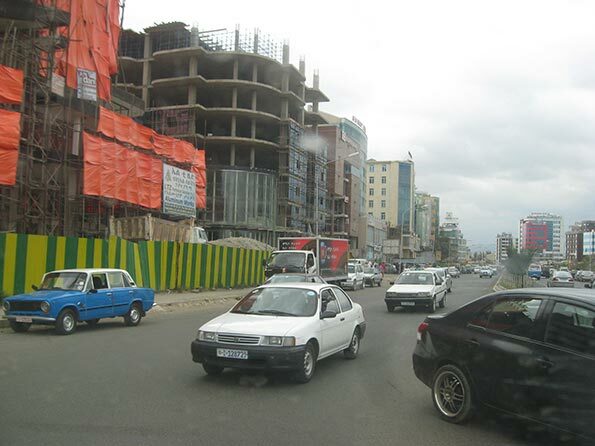 Addis Abeba is among the fastest growing urban areas in the world. Since 1970, the population has increased by nearly three times (Figure 1). However, the spatial expansion of the urban area has been much greater. The earliest available Google Earth satellite photos (1973) indicate that the urban land area (continuous urban development) has expanded over 12 times. Thus, the urban spatial expansion has been at least four times that of the population over the since the early 1970s (Figures 2 and 3). 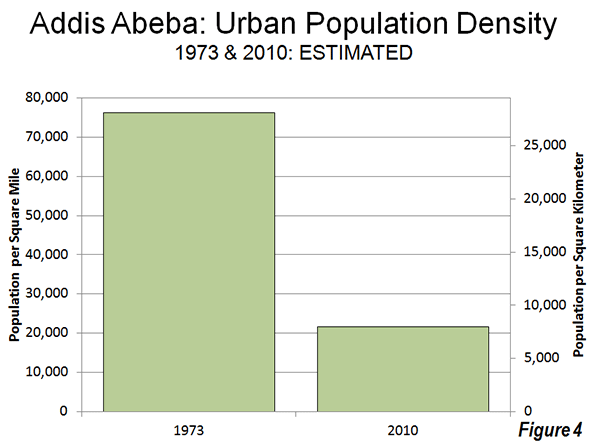 Since 1973, the urban population density of Addis Abeba has declined almost three quarters, from approximately 75,000 per square mile or 29,000 per square kilometer to 20,000 per square mile or 8,000 per square kilometer. 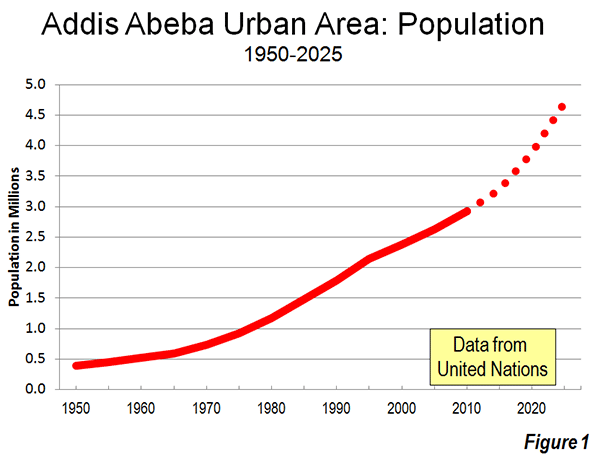 Addis Abeba represents yet another example of the counter-intuitive reality of growing urban areas simultaneously becoming less dense, because population growth occurs the generally less dense periphery in an organic city. It is not unusual for urban analysts to (wrongly) assume the opposite. 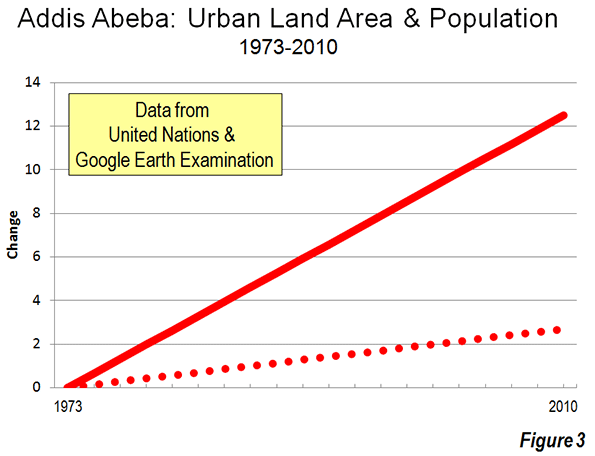 One of the results of the spatial expansion is a significantly better lifestyle for residents of Addis Abeba, consistent with the view of Professor Shlomo Angel, who decries attempts to constrain cities within artificial boundaries (compact city policies) because they can deny people both a adequate housing and a decent standard of living. Ethiopia is one of the poorest nations on earth, with a 2010 gross domestic product-purchasing power parity (GDP-PPP) per capita of just above $1,000. This places it 170th out of 183 geographical areas according to the International Monetary Fund. By comparison, the GDP-PPP of the United States was $47,000 and Singapore $57,000. Ethiopia's low income reflects Ethiopia's relativey low rate of urbanization. 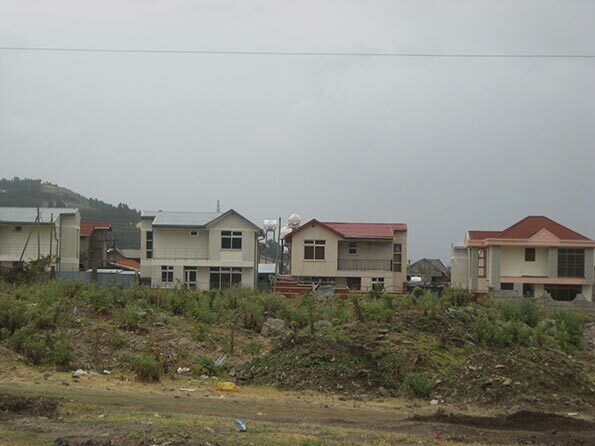 With 17 percent of the population in rural areas (outside urban areas), urbanization is concentrated in Addis Abeba (3.1 million), which is the only urban area in the nation with more than 300,000 population. Ethiopia can expect to experience a strong rate of urbanization in the decades to come, as people flock to the cities to seek better standards of living. By 2030, the total number of urban residents is projected by the United Nations to rise to 28.4 million from 13.9 million in 2010. Urbanization has its problems, but also economic advantages. The GDP-PPP in Addis Abeba, according to a Price-Waterhouse-Coopers estimate, is up to six times higher than that of the rest of the nation. Assuming that this ratio held to 2010, The GDP-PPP per capita of Addis Abeba would be $6,000 or more. Moreover, Price-Waterhouse-Coopers predicted that Addis Abeba would experience the 5th greatest economic growth to 2025, out of 151 urban areas. This would result in growth greater than that of Shanghai and Beijing. The four predicted to grow faster are the two large Viet Nam urban areas (Hanoi and Ho Chi Minh) and two in China (Guangzhou in the Pearl River Delta and Changchun in Manchuria). As would be expected in a developing world urban area, there is a large urban core with mixture of government and private buildings, literally surrounded by lower income, principally informal housing. 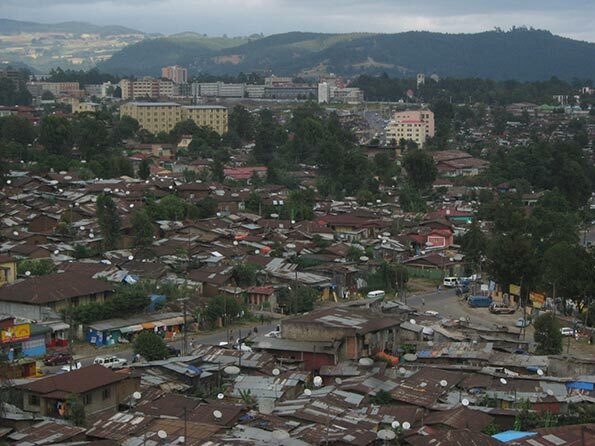 With this predominant informal housing, the population density of the urban core is by far the highest in Addis Abeba (See Photo: Informal Housing in the Urban Core: Parliament and Holy Trinity Dome in the Distance). Major government offices and cultural facilities are in this area, such as the Parliament, the prime minister's residence, museums, the residence of the primate of the Ethiopian Orthodox Church (Coptic), the most important cathedral, Holy Trinity, in which former Ethiopian leader Haile Selassie is buried, as well as the Catholic Cathedral and the largest Mosques. 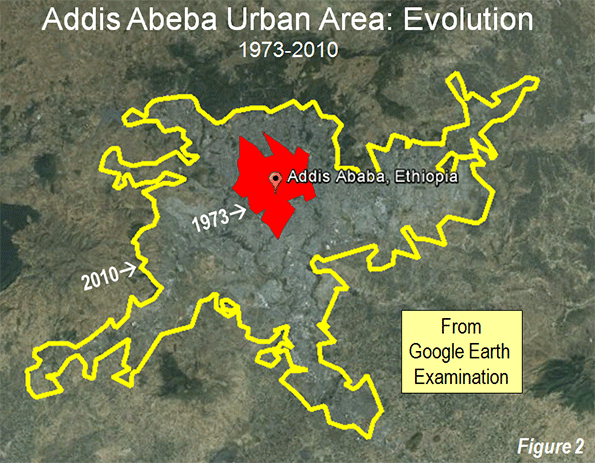 There’s been a huge expansion of the periphery around Addis Abeba. Extensive tours around the urban area provide evidence of relative prosperity. It appears that Addis Abeba is rebuilding itself around its urban core. There is major construction in three directions from the urban core. The greatest activity is in the Bole District, which includes Bole International Airport, to the south of the urban core. 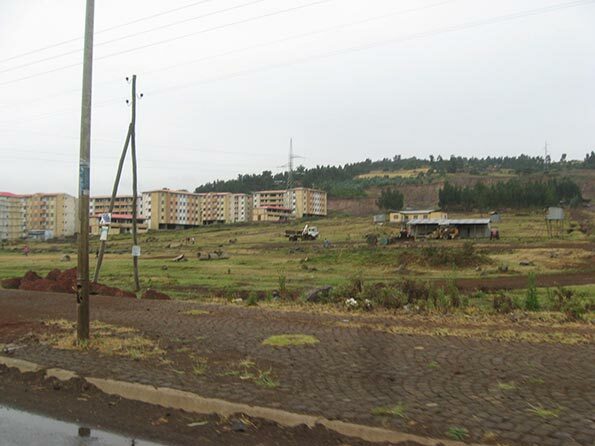 There is a substantial amount of new commercial high-rise construction within a few kilometers to the north of the airport, along two major arterials and in between (Photo: Bole Corridor Development). There are also a large number of large, private condominium buildings. The Bole Corridor represents an edge city, in the sense defined by Joel Garreau in his seminal book Edge Cities two decades ago. 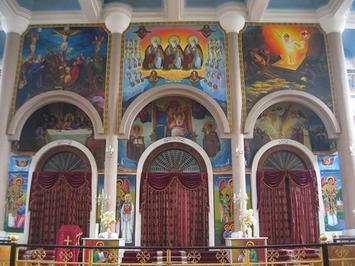 This is also the location of the largest Ethiopian Orthodox Church (see top photo) in the country. An eastern corridor stretches for 6 miles/10 kilometers from what is locally called the "Chinese Road," a ring road built largely with the support of the Chinese government. There are many new commercial buildings, government buildings, public and private condominiums, and at the edges, large new detached houses (See photo: Detached Housing in the Eastern Corridor). To the west, principally, the southwest, is a new residential neighborhood composed principally of condominiums, generally up to five floors (Photo: Southwest Residential Area). Chinese financial assistance is not limited to the ring road. 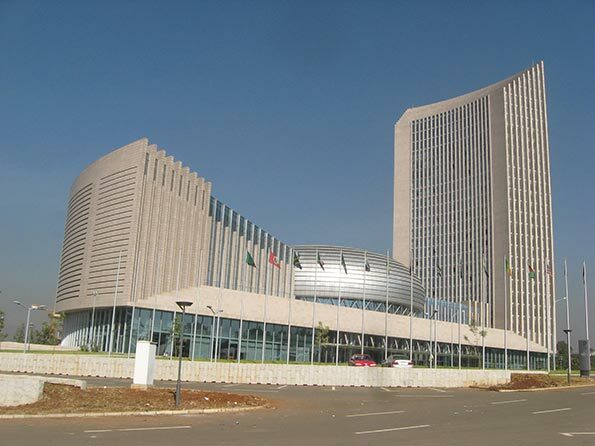 Much of the funding for the impressive new African Union headquarters (photo) was provided by the Chinese government. Further, a new light rail line will be largely financed by China. At the same time, the massive construction evident in the newer, outlying districts of Addis Abeba resemble (at least in a modest way) the urban development that has occurred in China over the past few decades. The economic progress evident in Addis Abeba is encouraging. The government policies are allowing the city to expand naturally as it grows, which facilitates better lives for its citizens. It can only be hoped that the day will come that people in developing world urban areas, such as Addis Abeba, will enjoy the high standards of living that have been achieved in the developed world. Photo: Holy of Holies, Bole Mehani Alem Church (Ethiopian Orthodox Churches all have a replica of the "Ark of the Covenant," behind a screen, which is referred to as the "holy of holies"). According to the Ethiopian Coptic tradition, the Ark of the Covenant, which tradition indicates, contained the tablets on which the Ten Commandments were written. The Ark was maintained in the holy of holies in the Jewish temple. The Ethiopian tradition holds that the Ark was taken to Ethiopia and is now kept at a chapel at a church in Axum, which is 600 miles/1,000 kilometers north of Addis Abeba. Submitted by jennacatlin4 on Tue, 05/12/2015 - 09:14. Secure Car Parking Gatwick service for the safe keeping of your car while you are away. Airport Car parking at Gatwick is reliable and cheap. Submitted by Adriano Santos on Wed, 04/15/2015 - 13:53. Submitted by Adriano Santos on Wed, 04/15/2015 - 12:20. The potential of Africans is very great! Congratulations for evolution! Submitted by bayseo on Tue, 03/24/2015 - 13:18. Submitted by technokar on Wed, 07/16/2014 - 04:28. Submitted by uali20 on Wed, 12/18/2013 - 15:30. Submitted by uali20 on Wed, 12/11/2013 - 15:29. Submitted by junction416 on Tue, 11/06/2012 - 15:48. I lived in the Bole Corridor and I would argue that it has nothing in common with an edge city, in the sense defined by Joel Garreau. There are many people who live in the corridor, it is not characterized by more jobs than bedrooms. It was urbanized more than 30 years ago, with new development involving the clearance of informal housing. I do think using theories, like the edge city, developed to think about North America cities, are appropriate for understanding development in a city like Addis. The society, place, and history of urban development are very different. Submitted by Darwin on Wed, 06/12/2013 - 12:48. This article was adapted from Joshua Brown's new book, Development Best Practices with Chapter 3 and drupalize.me, Who to Run From, and How to Maximize Your Investments. Submitted by Wendell Cox on Wed, 11/07/2012 - 10:02. Whether there are more "jobs" than "bedrooms" depends upon where the boundary is drawn, and there is no consistent source for such data. Some of the edge cities defined by Garreau are large areas, such as the "White Plains area" in New York. Others are more concentrated centers, like Las Colinas in the Dallas-Fort Worth area or Mid-town, adjacent to downtown Atlanta. Still others are narrow corridors along a main street, such as the Mid-Wilshire corridor in Los Angeles. My observation is that the Bole Corridor generically resembles this narrow corridor variety of Edge City. Further, Garreau did not require that the area not be urbanized 30 years ago. The fifth element of Garreau's definition of an edge city (from page 7) is that the area "Was nothing like a "city" as recently as 30 years ago. Then it was just bedrooms, if not cow pastures." Thus, the area need only have been outside the central business district (as in the case of Mid-town Atlanta, which is virtually adjacent to downtown Atlanta), either as a residential area or as a rural area. The Bole corridor, which you indicate replaced informal dwellings, qualifies under this definition. It was bedrooms before. Further, as often happens with those who chronicle trends missed by others, Garreau's "edge cities" term has taken on a life beyond his original definition. "Edge cities" has generally come to mean concentrated commercial and office development outside the central business district (downtown). Again, this describes the Bole Corridor.